You are currently browsing the tag archive for the ‘colors’ tag. Today I wanted to write more about giant clams and their astonishing ability to “farm” algae within their body (and then live off of the sweet sugars which the algae produce). I still want to write about that, but it proving to be a complicated subject: giant clams mastered living on solar energy a long time ago, and we are still trying to figure out the full nature of their symbiotic systems. Today, instead we are going to look at the phenomenon which gives the mantles of giant clams their amazingly beautiful iridescent color. It is the same effect which provides the shimmering color of hummingbird feathers and blue morpho wings, or the glistening iridescence of cuttlefish. All of these effects are quite different from pigmentation as generally conceived: if you grind up a lapis lazuli in a pestle, the dust will be brilliant blue (you have made ultramarine!) but if you similarly grind up a peacock feather, the dust will be gray, alas! This is because the glistening reflective aqua-blue of the feather is caused by how microscopic lattices within the various surfaces react with light (or I suppose, I should really go ahead and call these lattices “nanostructure” since they exist at a scale much smaller than micrometers). These lattices are known as “photonic crystals” and they appear in various natural iridescent materials—opals, feathers, and scales. Scientists have long studied these materials because of their amazing optic properties, however it is only since the 1990s that we have begun to truly understand and engineer similar structures on our own. 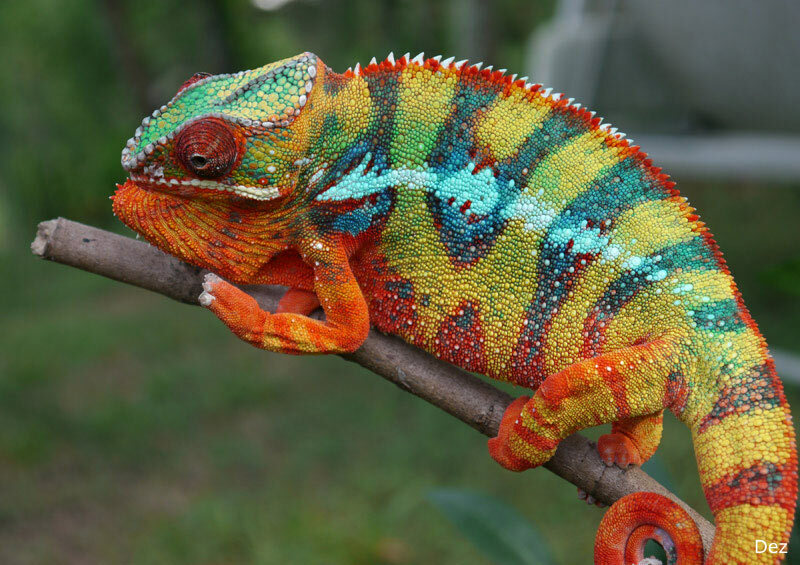 Physicists from the 19th century onward have understood that these iridescent color-effects are caused by diffraction within the materials themselves, however actually engineering the materials (beyond merely reproducing similar effects with chemistry) was elusive because of the scales involved. To shamelessly quote Wikipedia “The periodicity of the photonic crystal structure must be around half the wavelength of the electromagnetic waves to be diffracted. This is ~350 nm (blue) to ~650 nm (red) for photonic crystals that operate in the visible part of the spectrum.” For comparison, a human hair is about 100,000 nanometers thick. The actual physics of photonic crystals are beyond my ability to elucidate (here is a link to a somewhat comprehensible lay explanation for you physicists out there), however, this article is more to let me explain at a sub-rudimentary level and to show a bunch of pictures of the lovely instances of photonic crystals in the natural world. Enjoy these pictures which I stole! But, in the mean time don’t forget about the photonic crystals! When we get back to talking about the symbiosis of the giant clams, we will also return to photonic crystals! I have talked about how ecology is complicated. Even a symbiotic organism made up of two constituent organisms makes use of nanostructures we are only beginning to comprehend (“we” meaning molecular engineers and materials physicists not necessarily we meaning all of us). imagine how complex it becomes when there are more than one sort of organism interacting in complex ways in the real world! My iris is blooming today. I have blogged about it in the past (it’s a dark violet iris named “Night Ruler”), but it is so beautiful. It reminds me of how much I like irises (for the one week or less when they bloom). In celebration, I went to an amazing iris catalog online and looked up some other irises to fantasize what else I would plant if I had more sunny space in the garden. The online iris shop was amazing: each iris was more beautiful than the last and I soon became besotted with ruffles of magenta, black, caramel, icterine, and blue. Yet the best aspect of the whole endeavor were the beautiful madcap names. It turns out that weird computer algorithms cannot keep pace in any way with the visionary poets who name irises. A single random sweep gives us names such as “Vizier”, “Daughter of Stars”, “P.T. Barnum”, “Vigilante”, “Halo Everybody”, and “Sordid Lives.” These are not random names either—each of the irises has a moral quality which makes the reason they are named instantly recognizable. “Mango Queen” (above)looks like a female sovereign made entirely of mango flesh. “Sordid Lives” (below) is a big flouncy, heady mixture of plum, ivory, and stained brown. “Beach Dance” looks like an 80s movie I saw on cable once. My overall favorite (in case you have your credit card out and have decided to show your love of this blog in rhizome form) is a big German Iris named “Beefy” (at bottom) which looks like a bleeding hunk of rare roast beef in the form of an exquisite flounder. There are aesthetic marvels of beauty, horror, and wonder out there in the garden my friends. Let me know which ones are your favorites! 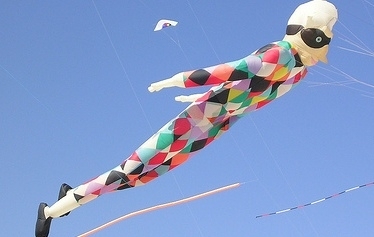 I have fallen in love with these colorful fabric sculptures by the great contemporary Chilean sculptor,Serena Garcia Dalla Venezia. Her works are simple conglomerations of little hand-sewn fabric balls and yet look at them: they are dazzling alien landscapes which also evoke the world of cell biology or coral reefs. Each work also combines color with visionary bravura. It is strange how the most simple ideas can expand into a world of captivating otherworldly beauty. Bravo to Serena Garcia Dalla Venezia. I look forward to seeing more of her gorgeous works and finding out more about her oeuvres. If you are like me, you yearn for the color-changing abilities of an octopus or a flamboyant cuttlefish. It’s going to be a long time before we have such capabilities ourselves, but surely technology can let us change the color of our surroundings and effects without repainting them. For a while now, the great laboratories and technology gurus have been promising us color-changing paint–where you walk into a room and turn a dial to change the wall color from green to pink to yellow to blue. I had a friend who shot some ads for GE who swore that this technology was about to hit markets (although since those ads were ten years ago, I am starting to have my doubts). What we do have is color changing chemicals which alter their tone based on temperature or light. 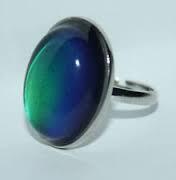 The compounds that change color based on temperature were used for “mood-rings” back in my parents’ day. Then by the time I was a kid in the 80’s we had light-sensitive polymers. There was a GI Joe toy–Zartan the super mercenary–which was featured in a series of jaw-dropping animated commercials. In the ads, Zartan was a color-changing mercenary with super-ninja skills–a formidable chameleon of death! However the actual doll looked more like a middle-aged professional wrestler heading off to KISS night at Fire Island. Also Zartan did not change color very rapidly. One of my friends had the figurine and it engendered lots of dubious phrases like “look his arm is already turning a little bit gray….I’m sure of it.” Zartan’s legacy was not dissimilar from that of “The Diving Dolphin” a way to teach kids that ads do not necessarily reflect reality. Anyway, all of this is to introduce the fact that I won a minor bet with my roommate! 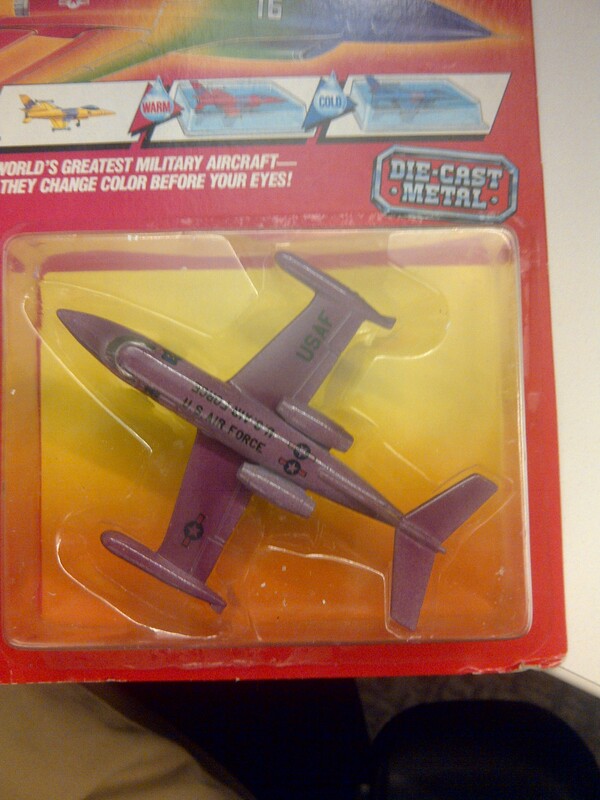 In a fog of victory, I jokingly asked for a jet (assuming that this was a way to permanently dismiss the subject) but she went online and bought me a super-awesome color-changing toy plane! It has been sitting next to me at the office as the seasons change and the Heating/Air-Conditioning goes haywire in various colleague-enraging ways. 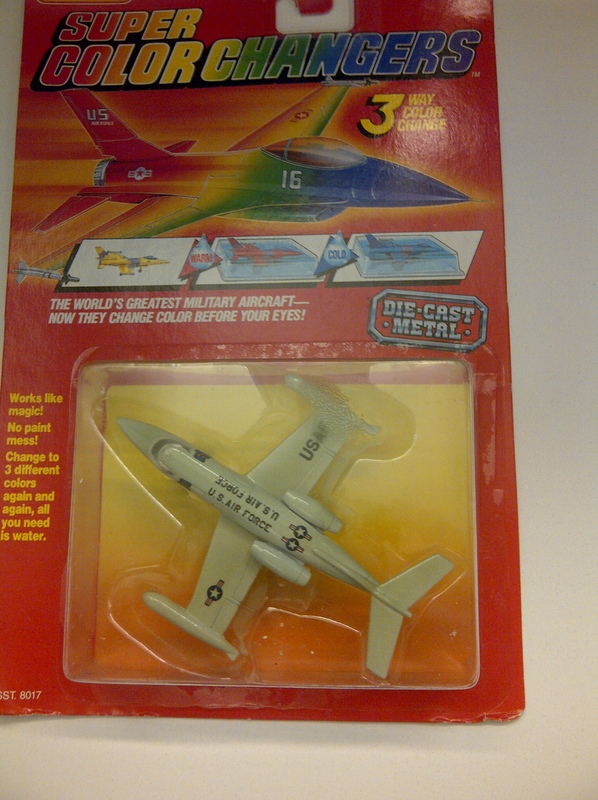 Here, therefore are actual photos of this astonishing color changing jet still in its original packaging. The jet’s ambient color at neutral office temperatures is bright mauve. When the pilot flies his craft into the cold temperature of the upper atmosphere (or alternately, into the freezer next to the frozen peas) the plane turns dark puce and then dark brown! Flying out of the freezer, this experimental craft next landed on the sweltering environs atop of a huge mug of hot coffee. Soon the brown faded back to purple and then to blotchy magenta, and finally to pure US Air Force gray. 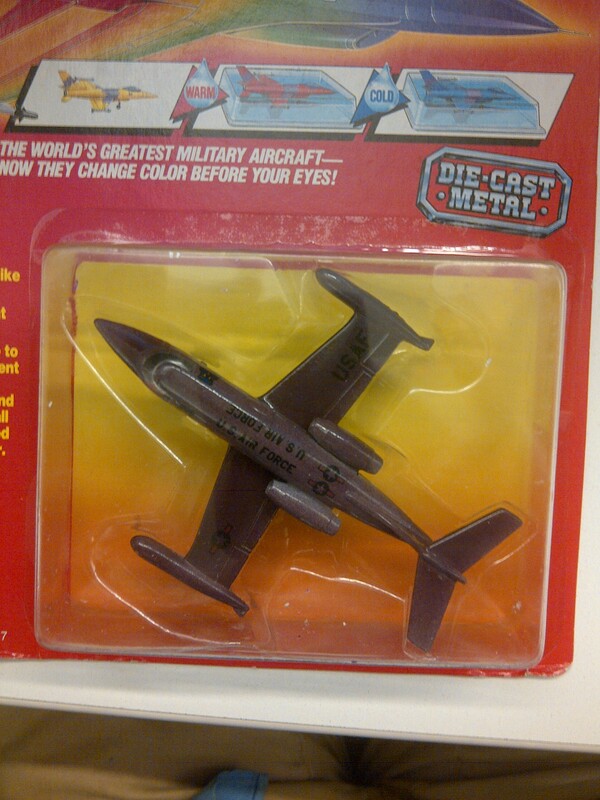 Mattel really outdid itself–this is a great toy! 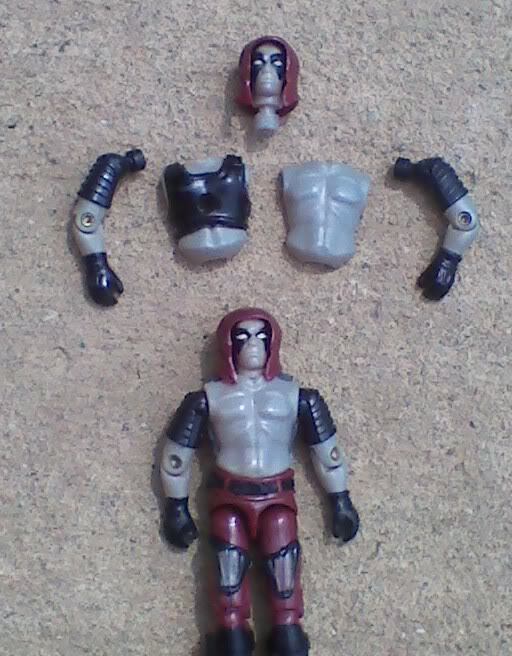 Zartan would be green with envy…eventually…well, maybe a little bit by his elbow? Let’s hope GE gets its act together so we can change our walls from bright magenta to gray to chocolate brown. That will be a future worth having! Sooo…I try to keep it light on Mondays so we can get through these long weeks, but one of our recent posts demands an immediate follow-up. Remember how I was discussing the grim fate of ‘Gros Michel’ (‘Fat Michel’) the strain of bananas which were wiped out by Panama disease in the 50s? Well, Panama disease has mutated and returned. 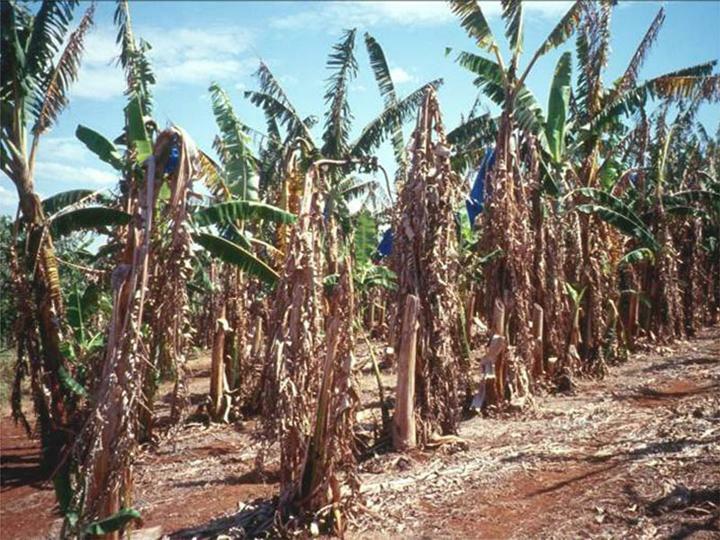 It’s baaaack…and this time it destroying the once immune ‘Cavendish’ plants which make up almost every banana in Europe, Africa, and the New World Photos are becoming more and more common of dying banana plants and desperate farmers burning their groves. ‘Cavendish’ plants are clones and if one is susceptible, they all are. I really like bananas (when they are ripe) and the idea of doing without the radioactive potassium-rich fruit makes me sad. What are we going to do? I guess a good market solution would be to make a transgenic banana that was resistant to the Panama disease, patent the critical gene fragment, and then sell sterile clones of the frankenfruit. Since I like science and bananas (though not necessarily giant agribusinesses) so this is an acceptable solution to keep the yellow fruit on the table. An alternate idea, however strikes me as far better. 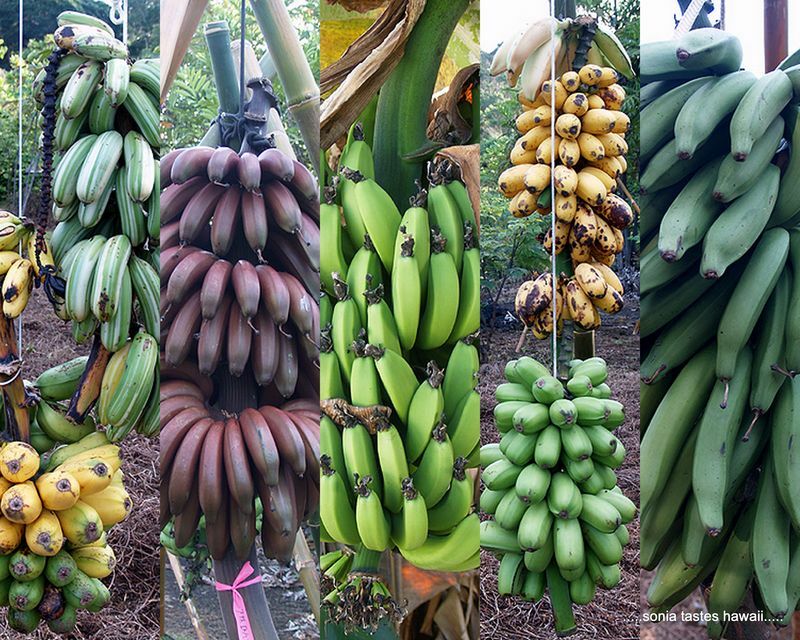 We should send out teams of banana farmers and taste-testers to South East Asia (the first home of the banana) to collect purple, white, red, and gray bananas. Different folks can start growing all sorts of new bananas around the world. Undoubtedly some of them are more delicious than ‘Gros Michel” and I bet they are all more resistant to the blight. Here in Nepal we have all sorts of different bananas growing wild & in cultivation. They vary from short sweeties to starchy plantain sorts. Nepalis don’t have names for the different types of bananas. One of the tastiest varieties here is the ugliest – it is rather small (fingerlike), sporting a mottled greenish black peel with patches of gray lichen when ripe. The peel is surprisingly paper thin but the the flesh is a rich golden yellow & the taste is the most incredible, sweet custard-y banana flavor ever. I have never tasted this type of banana anywhere but Nepal. 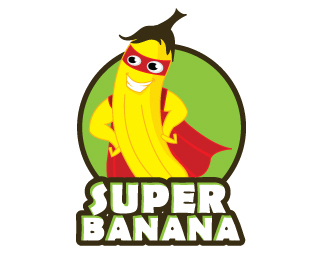 Most Asians prefer the starchy, bland bananas that most westerners would consider unripe – they think by the time a banana gets to the yellow mottled with brown stage it’s rotten. Who here doesn’t want to try these delicious ugly bananas? I am ready to pack up and head off to Nepal just to try them! What we have is a marketing problem. If these charlatans can sell people on stuff like organic food and bottled water, why can’t they sell delicious (but ugly) finger-length bananas? The second coming of Panama disease needn’t spell the end of bananas (although we may lose the familiar bright yellow “Cavendish”)—perhaps this could be the beginning of a glorious new era of multicolor bananas of all sizes and flavors! 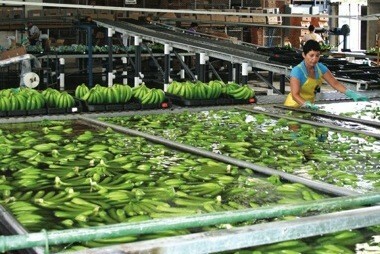 Or we could use technology and modern farm techniques to make some crazy bananas! We have previously addressed the chimerical nature of magenta—a color which does not actually exist, but strongly seems to because of the way that humans perceive light. In the intervening years, you have probably been wondering if there are other colors like this: hues which are not there except for tricks of the brain. Today we bring you an amazing & impossible color from the underworld. “Stygian blue” is a supersaturated blue/violet which is also as dark as the darkest black! 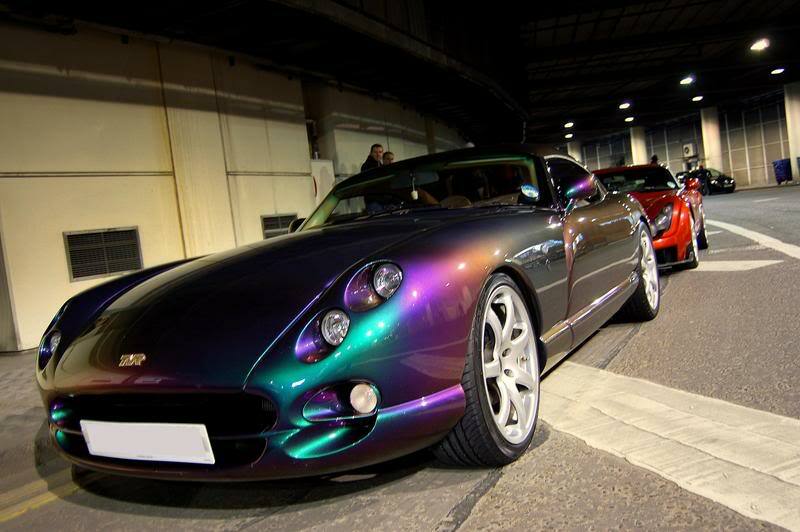 It would be the coolest color in the rainbow except for the fact that it isn’t real…but you can still see it. In fact, if you keep reading, I’ll show it to you right here! Before you call in the men with big white nets (who, like the bill collectors, are always creeping nearer anyway) allow me to explain. Stygian blue appears to exist because of the opponent color theory (explained below in an utterly unhelpful and incomprehensible diagram) a theory of color pioneered by the dramatist, poet, and polymath Johann Wolfgang von Goethe! 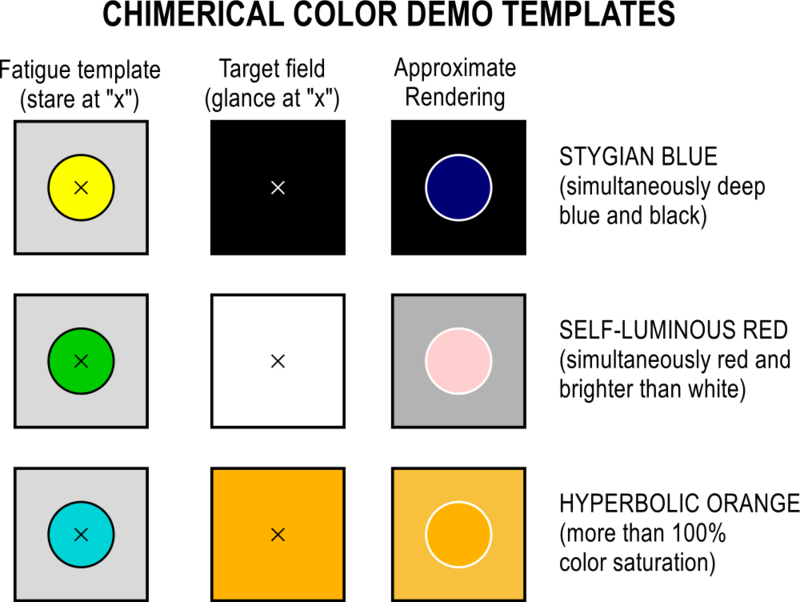 Opponent color theory deals with how the eye (and the mind) process information received from the three types of color-receptive cones commonly found in the human retina. Setting the biological details to the side, the theory essentially posits that certain colors reciprocally evoke fundamental opposite colors: blue and orange are opposites; red and green are opposites; yellow and purple are opposites; and so forth. This blog has come near to this territory before (with a pumpkin-colored Chevy Chase?) and we will return to component colors again, since they lie at a nexus between physics, aesthetics, neural science, and the unknown. But right now we only need to recognize that the opposite of dark blue is pale orange (at least to the human eye). In order to see stygian blue we must utilize a trick of physiology. If you stare long enough at a strong hue: you will see an afterimage of its component opposite—the negative reflection of the image you have looked at. 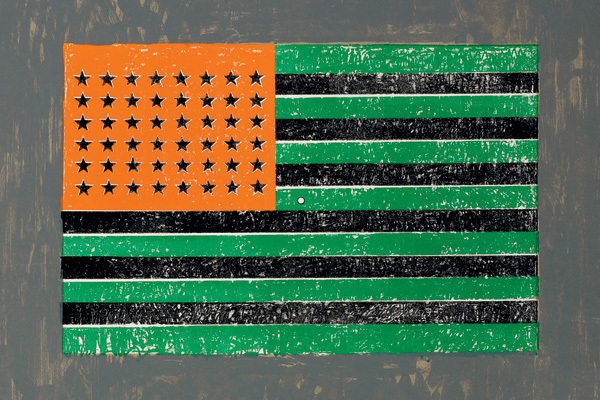 A famous example is hack artist Jasper John’s bizarro American flag in orange, black, and green. 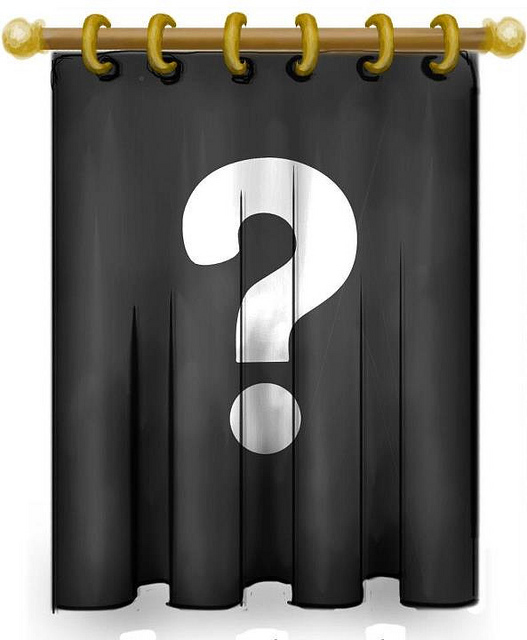 If you stare at it for a few minutes, and then look at a white wall, you will see old glory proudly waving in your eyes…but there is no actual flag. Likewise if you stare long enough at an orange/yellow blob, and then look at a black field, you will perceive a glistening phantasmagoric shade of ultra-blue which is as dark as the black, but is not black—stygian blue! Here is the swath I stole from Wikipedia which allows to do this while staring at your own monitor in the comfort of whatever cubical farm/battlefield/hyper-space sarcophagus where you are reading this. Please note you have to stare with unflagging diligence at “x” for quite a while! As a bonus the image includes some two other chimerical colors, hyperbolic orange and self-luminous red (which I did not think were sufficiently interesting to lead this essay, but which “exist” based on the same basic principles). Of course this does not actually involve any ghosts, supernatural entities, or Lovecraft colors which drive you insane (more so than usual anyway). Stygian blue is merely a trick of the brain…but so are a lot of things we spend our lives striving for and working on. I for one find the color quite pretty and I would wear it or use it in my paintings if such a thing were at all possible. 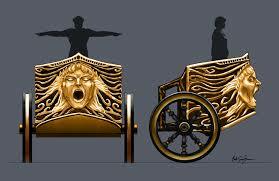 For example it would be a great color for a screaming Gorgon chariot! Did I mention that my parents operate a yarn shop? Its name is Market Street Yarn and Craft and it is located in Parkersburg, West Virginia. Drop by when you are in the Mid-Atlantic? South? Midwest? whatever region of the nation West Virginia is in. 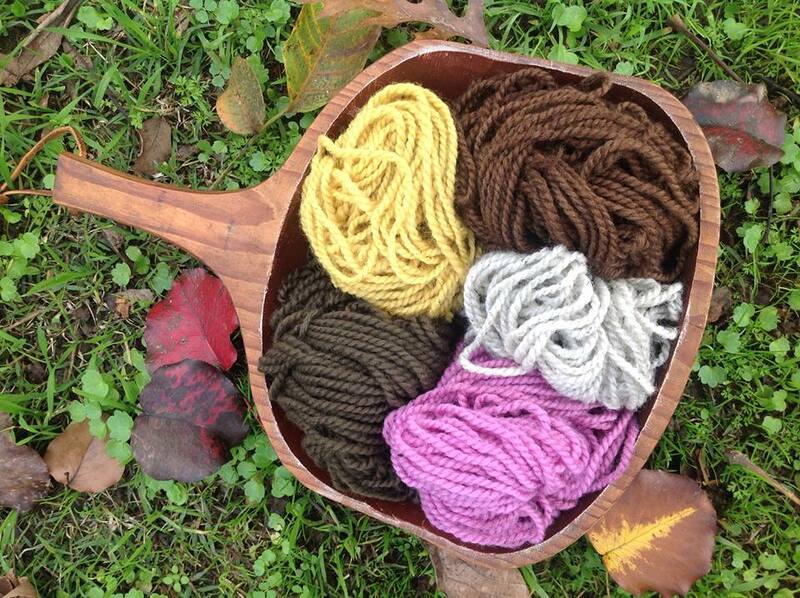 I don’t crochet, knit, or weave, but I love going into the store anyway because there are so many colors of yarn! 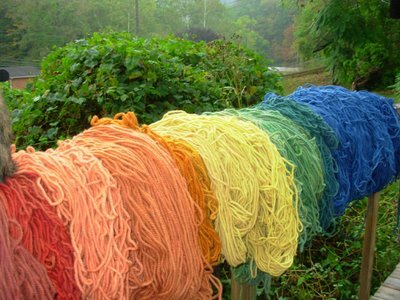 From floor to ceiling there are innumerable balls, skeins, spools, and coils of every sort of fiber in every conceivable color. There are exquisite colors which I have never seen before: greens the color of uncategorized tropical plants, pinks that resemble inconceivable candies from a mad confectioner, midnight violets out of formless dreams… I’m a painter, and I am used to the pigments of my trade: iron oxide, cadmium, cobalt, lead bicarbonate, phthalocyanine, and so forth. 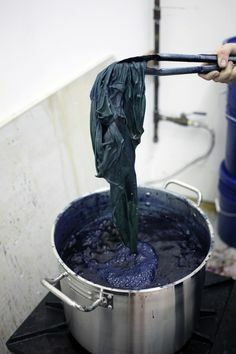 However, dyers have an entirely different palate made of weird organic compounds (well, there are synthetic dyes too, but a lot of them have the same industrial look as everything). It means that many of the colors have a unique glowing beauty and a strangeness which draws the eye. 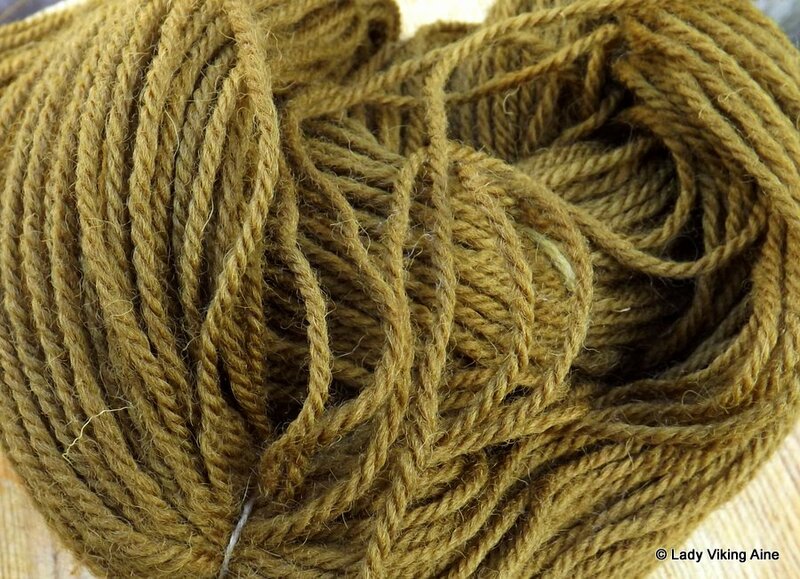 There are many different animal fibers—llama, camel, goat, rabbit, muskox, and silk—but of course the vast majority of the yarns are wool, which is sheep hair. 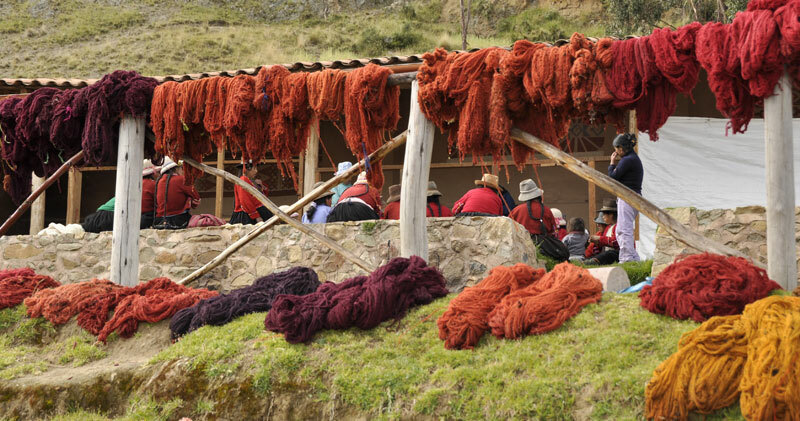 Dying wool is an ancient craft which predates writing or money! Maybe chemistry isn’t the only reason some of those colors are so unique. 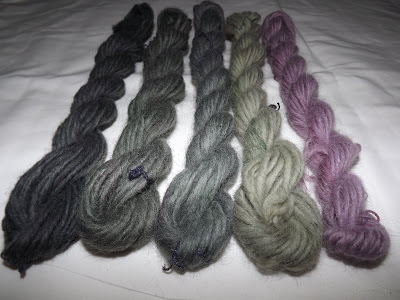 Some dyes naturally permeate wool fiber and then stain it permanently, but other dyes require a mordant in order to remain permanently colorfast. 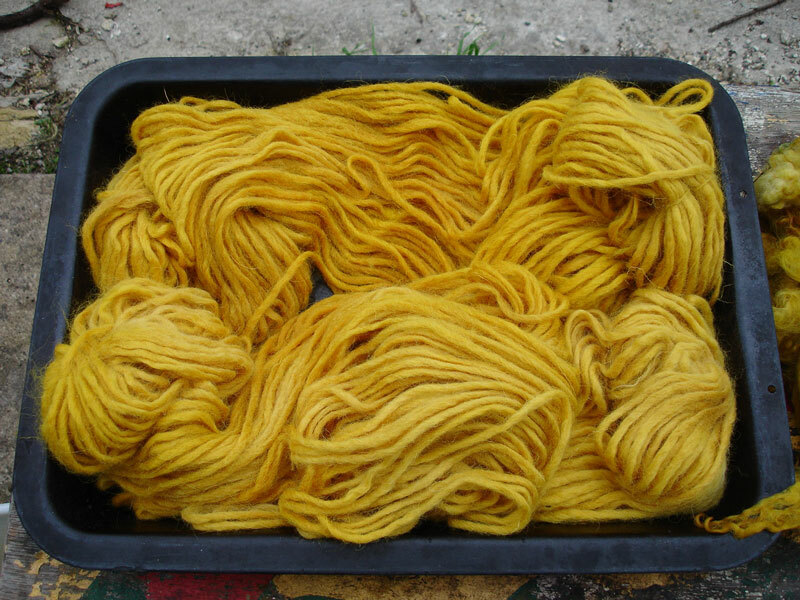 Dyeing really is an ancient artisanal craft so, like cheesemaking, carpentry, pickling, or bellcasting, it has its own unique demands which are stated in a specialized language. 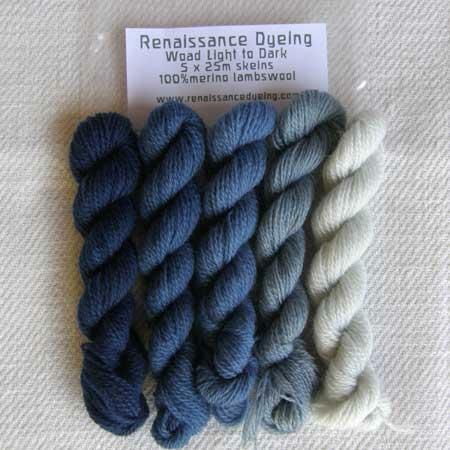 There are dyeing words which descend directly from Old English and Latin. This is a stylish way of saying I am not going to be able to comprehensively write about dyeing wool. 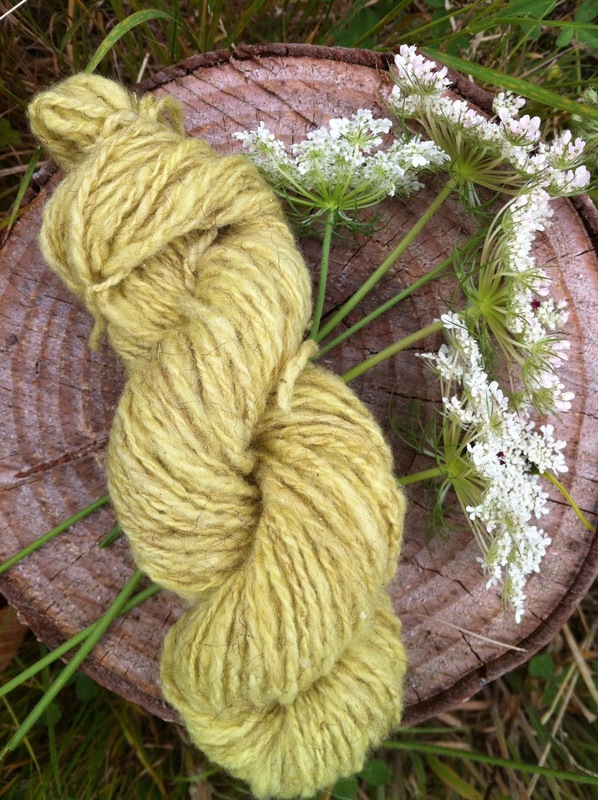 Instead I am going to present a crude little picture gallery of the colors produced by commonly used natural dyestuffs. Woad is a flowering plant from the steppes of Central Asia which is also known (horrifically) as “Asp of Jerusalem.” Because it has been used for so long as a dyestuff it naturalized to Europe in classical and medieval times and now even lives in the Americas. Queen Anne’s lace is a member of the carrot family. Native to Europe, it was naturalized to North America by European settlers for unknown reasons—maybe because it can be used to dye fabric off-white (?). A bizarre hybrid organism consisting of algae and fungi living in complete symbiosis, lichen comes in many species and varieties. 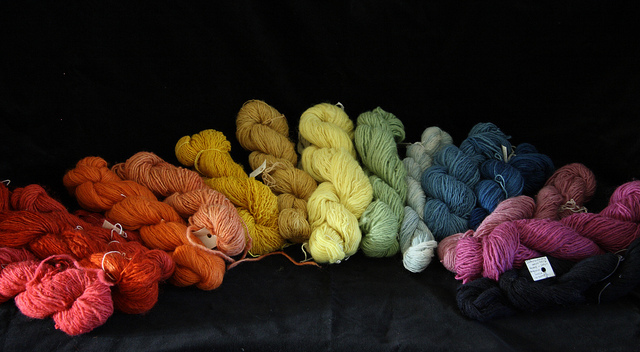 It can be used to make some of the most colorful and stunning dye colors. Cochineal is a name for ground up insects which live parasitically on the carmine plant. 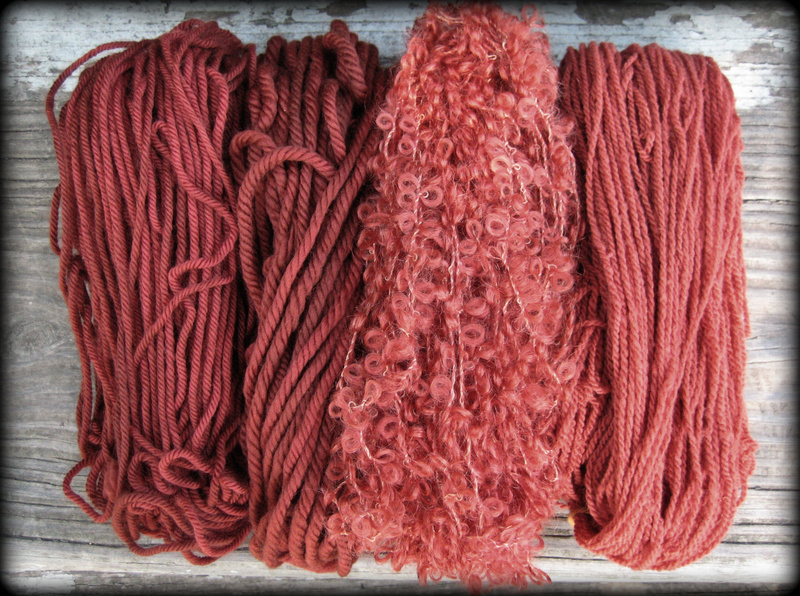 They make a beautiful deep red dye which was once very expensive and denoted royalty or wealth (like murex dye). Turmeric is a healthy yellow spice which also dyes animal fibers bright yellow. An Indian pathologist once confided in me that everyone he had dissected from the subcontinent had yellow viscera because of turmeric (a Ferrebeekeeper fun fact!). Onionskin is, um, the skin of onions and produces the earth color seen above. Pokeberries are inedible berries of an exquisite deep purple. They look so tantalizingly delicious and juicy, but beware, they are poisonous (and used to cause a fair number of deaths back in hungrier times). Get back at them by boiling them into a dye and making the surprisingly pretty hues above. Risk getting stung for this bewitching green? Nettles are stinging plants which are fascinating in their own right (and which humankind has put to sundry uses for a long time). 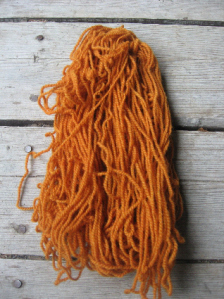 When boiled and used as dye they produce a very pretty color of fabric. Of course this is just a random list of interesting colors which I liked (although it does provide a rudimentary rainbow). Some of these materials are rare or expensive… and may not perform as advertised without substantial tinkering. However sheep week would not be complete without a cursory mention of the dyer’s art (which is so necessary for the aesthetic appreciation of wool). 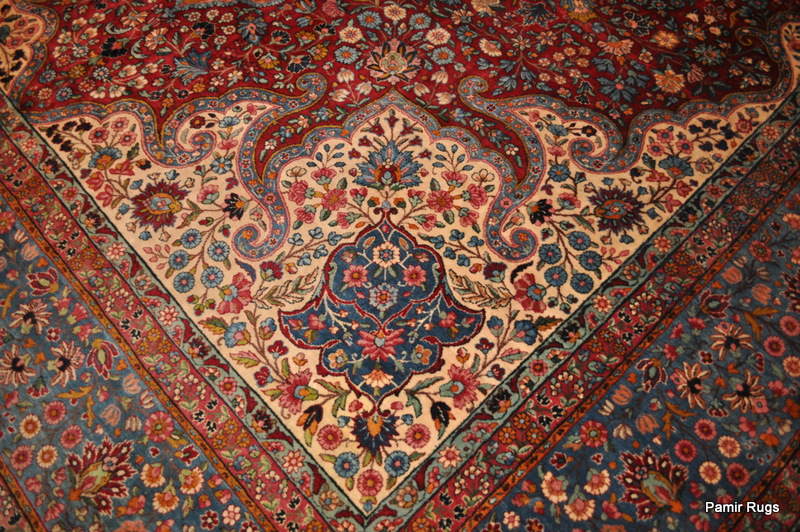 It’s strange to imagine that the most beautiful Persian rugs are really bits of wool carefully dyed with plants which have been woven together! 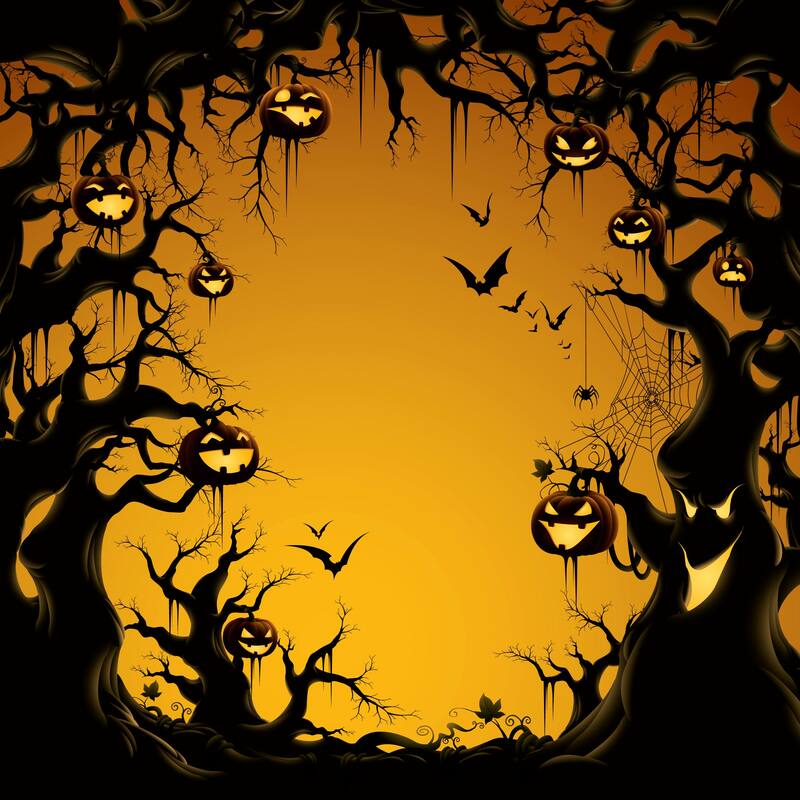 During secondary school in rural Ohio the music teacher annually dug out the moth-eaten scores for a bunch of Halloween songs including “Black and Gold,” (the lyrics of which I still somewhat remember). 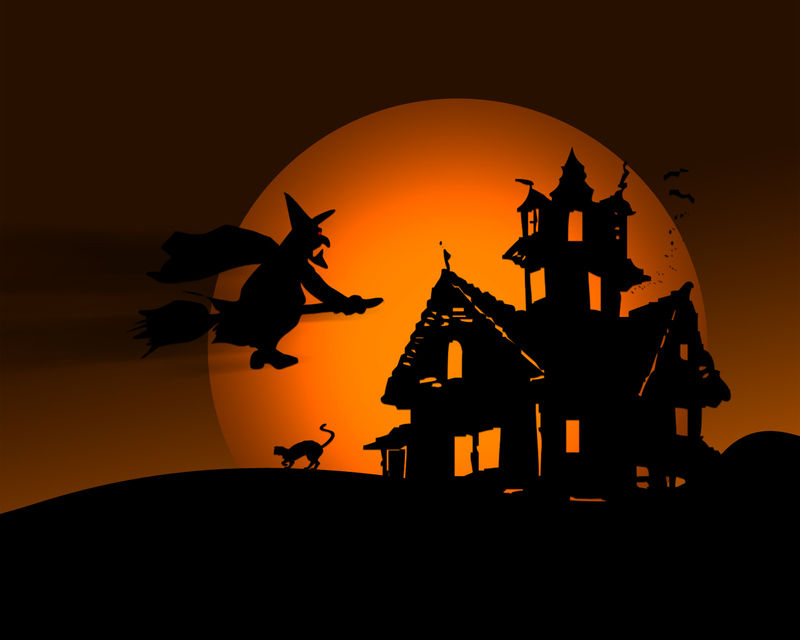 The song was a doggerel hymn about the colors of Halloween season and the lyrics were just a list of black and gold items: jet black cats with golden eyes, golden goblins, pumpkins, and black shadows. Some young wag always said “this should be titled ‘black and orange,’” which I thought was a fair point based on all of the orange and black candy and decorations around. 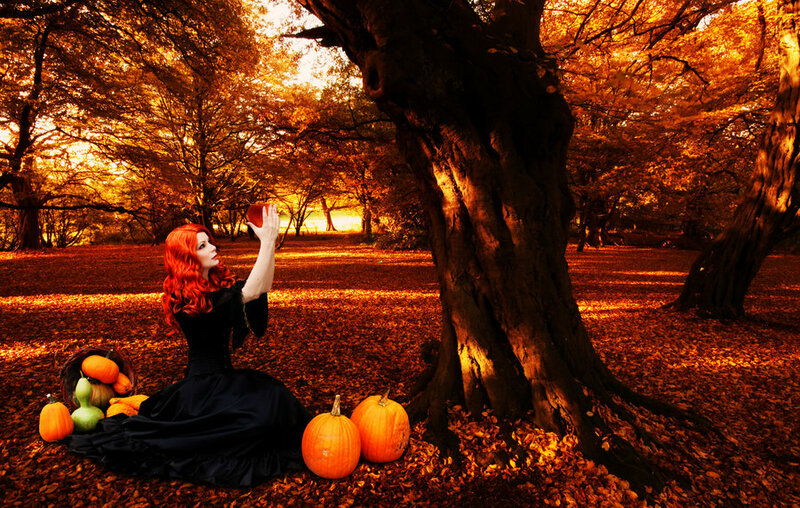 Allegedly the seasonal color scheme of black and orange go back to the ancient Celtic traditions which Halloween comes from. Orange (or rich gold/saffron, maybe) is the symbolic color of the harvest, the crops, and the autumn leaves whereas black represents night, death, and winter darkness. It’s a good color combination, but I always wonder whether the seasonal obsession with bright orange and black may be more a result of marketers rather than ancient Celts—or maybe they actually dug out black robes and golden sickles every year for Samhain just like the music teacher got out those smudged Halloween music sheets. If it is a marketing tradition, the marketers chose well. Orange and black are beautiful together and perfectly fit the season, but you rarely see people running around wearing this combination other than tigers and baseball players (and tigers aren’t even people). I wonder of there are shopping seasons in the future that likewise will be known by color—like back to school will be aqua and puce. Perhaps the seasonal holiday colors are predetermined by the natural colors season. 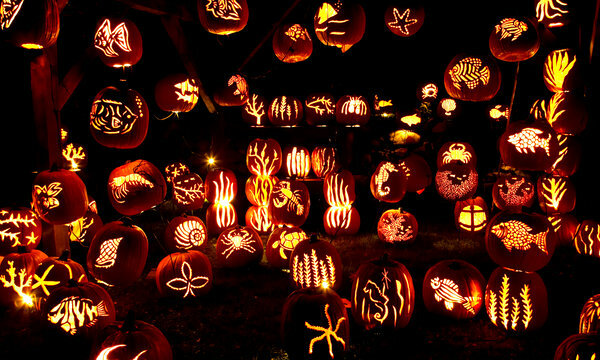 Do Australians have a creepy death holiday in their fall (our spring) or what? Or is everything just orange, dun, and buff there every season? What are holiday color combinations from other cultures? Here at Ferrebeekeeper we try and try to explain things coherently, but, alas, some things just refuse to be contained into coherent categories. One of those things appropriately is “harlequin” a word which has come to mean all sorts of contradictory things—particularly when it is used to describe color. 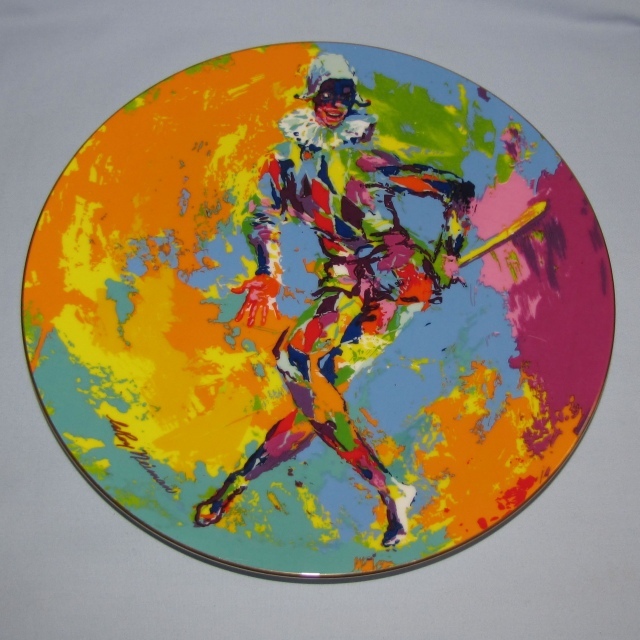 Harlequin was a main character from the Italian Commedia dell arte, a form of masked farcical theater popular from the 16th through the 18th century. 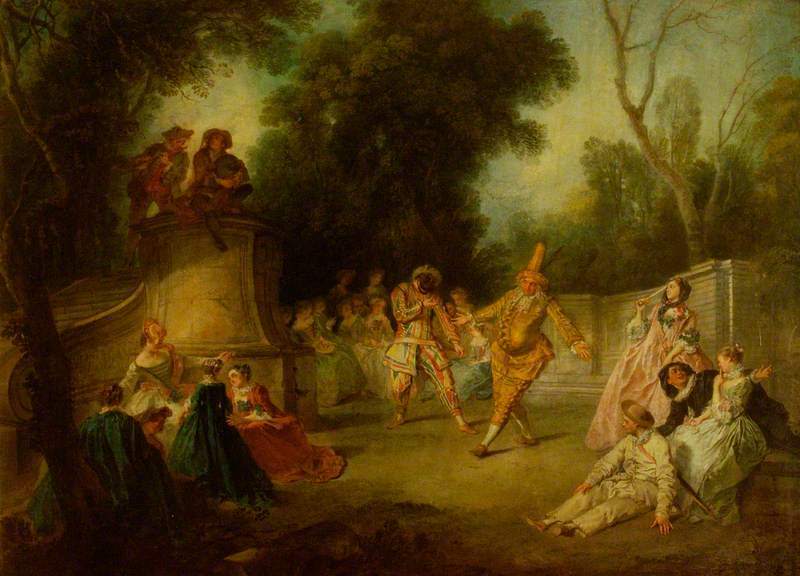 Commedia dell arte emphasized certain humorous stock characters (like the stingy master, the coquettish daughter, the cowardly suitor, and so forth). 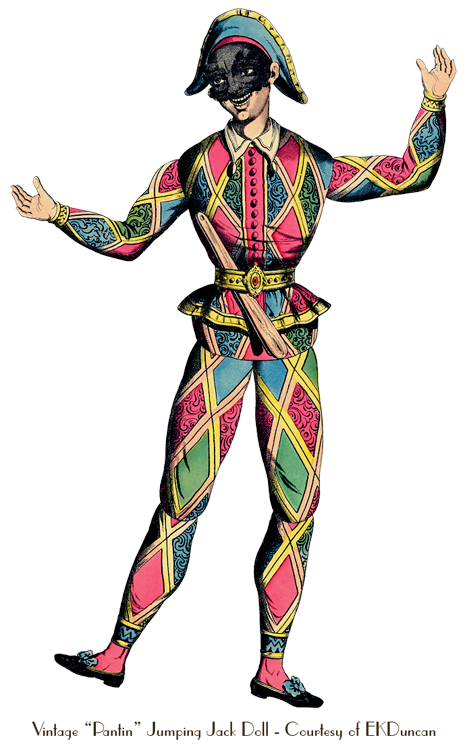 Harlequin was one of the most cunning and ingenious masked servants–a character so crafty that he frequently outsmarted himself. The character evolved directly from the cunning devil character of medieval pageant plays (with a bit of the king’s fool thrown in). Just as the harlequin predated Italian farcical comedy, he (and she) outlasted the form and became an integral part of circuses, burlesque shows, advertising, cartoons, and so forth, right up until the present. Aside from their puckish wit and masks, harlequins were famed for their mottled garb of many colored diamonds or triangles. These spangled parti-colored outfits were one of the crowning glories of Commedia dell arte, and the look quickly became a part of show culture throughout the western world. Many artists, poets, and marketers were inspired by the bold & brassy look of harlequins and the word became used to describe colors and patterns. Frustratingly, the word is used by different sources to describe completely different colors and patterns. Among the classically minded it still describes a triangular or diamond pattern of many different colors. To the British, from the nineteen-twenties onward, “harlequin has been the name for a bright shade of yellow-green (inclining towards green). To make matters even worse, in the early 21st century, paint manufacturers created a metallic paint which changes color depending on the viewing angle. This unearthly effect is accomplished by the reflection/refraction of light upon tiny aluminum chips coated with magnesium fluoride (all embedded within chromium). Naturally one of the marketing names the paint makers chose for their product was “harlequin”. Harlequin is even used to describe a garish mélange of many crazy colors with virtually no discernible pattern! So if you are reading a contemporary work and a color is described as “harlequin” you will have to work out for yourself what it means. The whole mess makes me feel like I have been tricked by a masked fraudster from Baroque Italy. Quite possibly we all have been. The base color is pure white with black torn patches irregularly and well distributed over the entire body; a pure white neck is preferred. The black patches should never be large enough to give the appearance of a blanket, nor so small as to give a stippled or dappled effect. Eligible, but less desirable, are a few small grey patches (this grey is consistent with a Merle marking) or a white base with single black hairs showing through, which tend to give a salt and pepper or dirty effect. Wow! Dog coats are serious business–especially for the Great Dane, the princely “Apollo of Dogs”. Here is a harlequin Dane relaxing with his human companion. 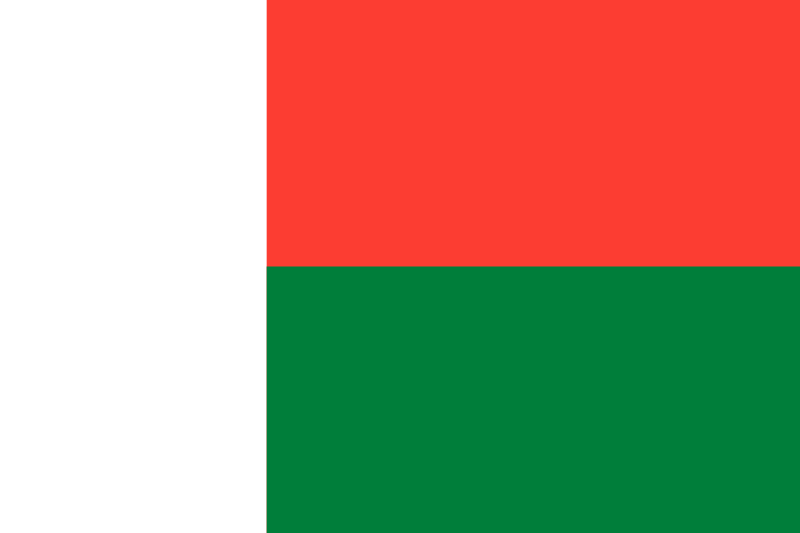 This is the flag of Madagascar: three rectangles of white, red, and green. The rectangles are nearly equal in size (although the vertical white rectangle is slightly wider). The flag has been the symbol of Madagascar since 1958—which means it was adopted two years before the island nation became independent of the French empire in 1960. Madagascar is an ancient island subcontinent which is currently located in the Indian Ocean just east of Sub Saharan Africa (it has actually moved around a great deal during geological history–but that is irrelevant for a post about the national flag). 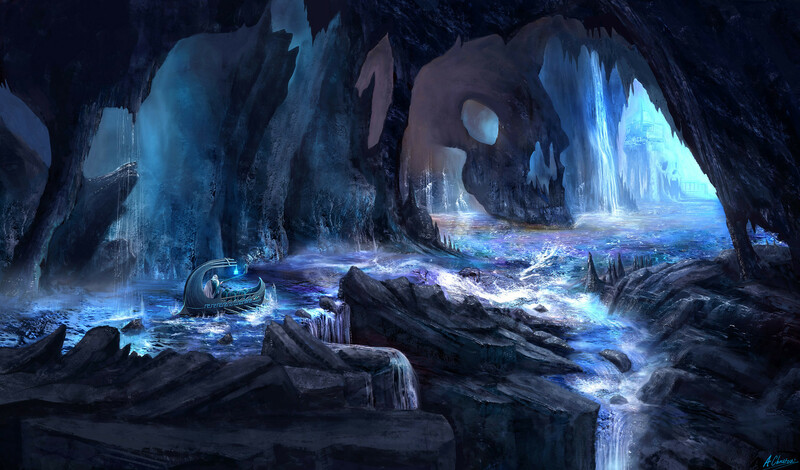 The large island was colonized by two waves of human inhabitants. 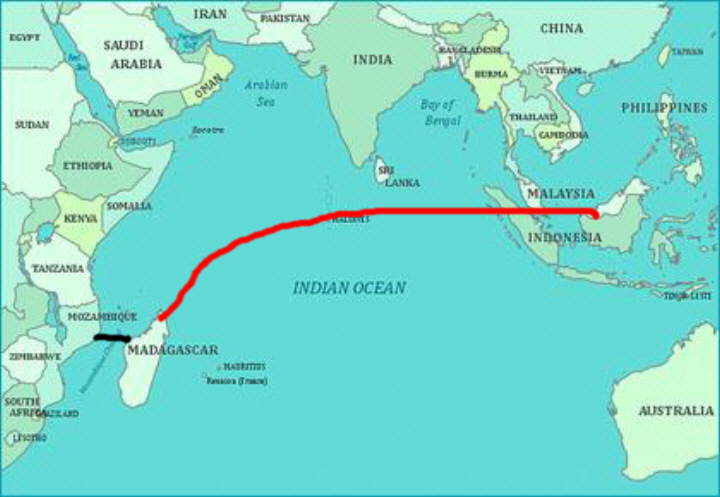 The first Madagascar people were Austronesians who arrived between 350 BC and 550 AD via boat from the island of Borneo. Boneo and Madagascar are about 7,600 kilometers (4760 miles) apart, so this was no trifling feat of navigation! 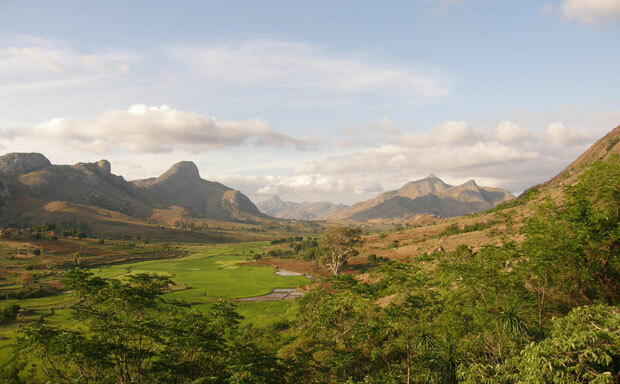 The second main wave of human colonization took place around 1000 AD, when many Bantu people crossed the Mozambique channel–which is a more manageable boat journey of 460 km (286 miles). 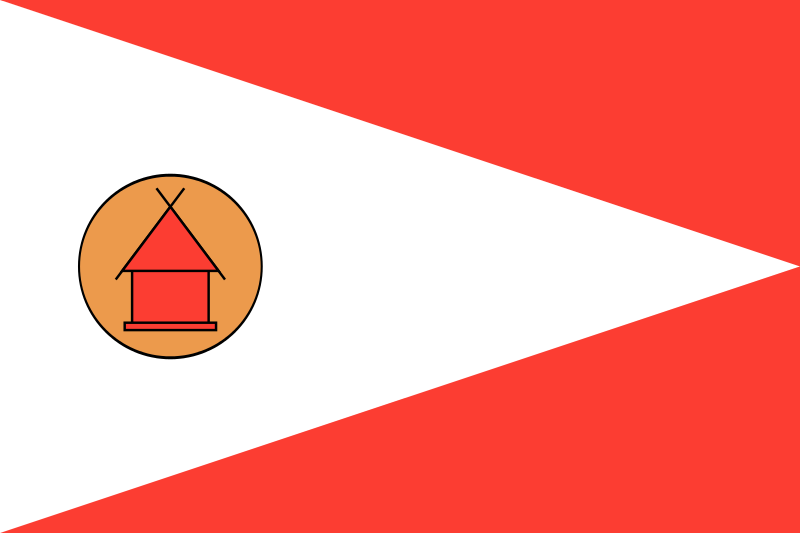 The red and the white of the Madagascar flag are said to represent both the Merina kingdom (which fell to the French in 1896) and the colors of the flag of Indonesia (red and white) which was where the first Madagascar people hailed from. The Merina people are highlanders who culturally dominated the island for centuries. The green of the flag is said to represent the Hova people—the free peasantry. During the Merina kingdom, society was divided into three classes: Merina aristocrats, Hova peasants, and slaves (coincidentally these slaves were obtained from raids on the Makua people during the 19th century). The Hova apparently played a large part in the 1950s independence movement against the French colonial authorities. In conclusion, the more I have studied the Madagascar flag, the less sure I am that it means anything. I feel like some graphically inclined revolutionary might have made up the whole thing in 1958 because he liked the colors. More importantly however, I have become fascinated by the strange human history of this perplexing mini continent which was inhabited so very recently.